← Happy Friday from a Fellow Cheerful Chemist! Fluorescent Silk: Awesome Science and Fashion! Good Evening! I have a short post for you today: cool genetic engineering and a possible new trend in the fashion world. Scientists have found a way to make fluorescent silk. The new material is comparable to normal silk and designers have already used it to make their clothes. The picture below is a wedding dress made from this new silk. Fluorescent silk wedding dress by Japanese designer Yumi Katsura. To produce this silk, scientists inserted a fluorescent protein sequence into the silkworms’ DNA. The fluorescent protein gene, fibroin H chain, is injected into a silkworm egg right after it has been laid. This gene sequence incorporates itself into the developing silkworm’s DNA. The result is a transgenic silk worm. So far, the researchers have produced three different colors: red, green and orange. 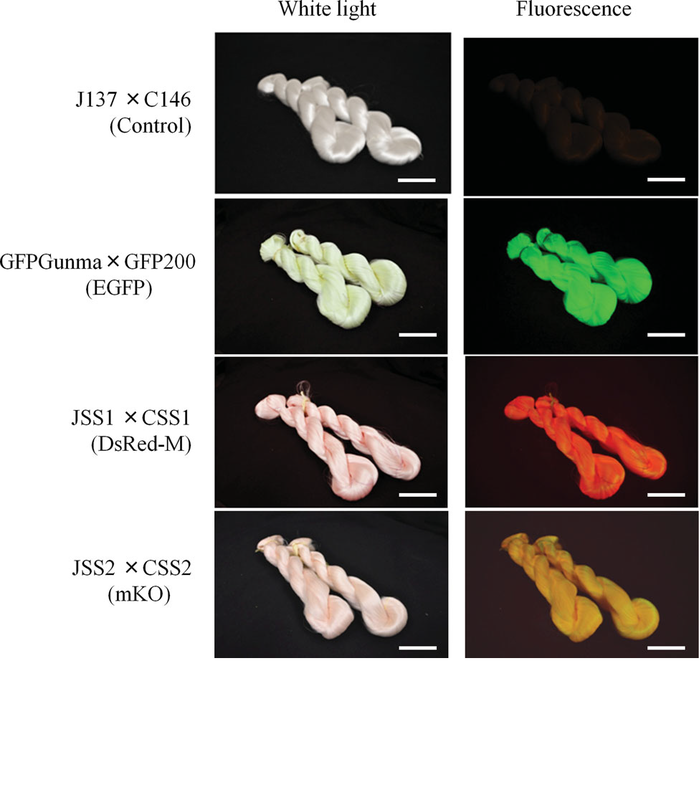 Because the fluorescent protein sequence becomes integrated into the silkworms’ DNA, the silkworms’ offspring will also be able to produce fluorescent silk. So people can breed the transgenic silkworms and produce the fluorescent silk in large quantities. According to The Scientist, 20,000 genetically modified silkworms have already been raised and are hard at work making more silk. Coming Thursday: How molecules fluoresce! The Cheerful Chemist focuses on amazing molecules and interesting facts about the chemical and biochemical sciences. This entry was posted in New Developments in Chemistry and tagged Biochemistry, Biotechnology, chemistry, fashion, fluorescence, fluorescent silk, genetic engineering, Genetics, science, silkworm, transgenic silkworm. Bookmark the permalink. 4 Responses to Fluorescent Silk: Awesome Science and Fashion! All original pictures and content I post are intended for the education and enjoyment of my readers. Please feel free to use and share! The cheerful chemist's header is adapted from http://periodictable.com/ by Theodore Gray and Nick Mann.